Winesave's very easy-to-use and affordable technology means any wine lover or hospitality venue can now enjoy their favourite wines by the glass without the worry of their wine spoiling through oxidation. Winesave ... for keeping opened wine perfectly. If you think Beaujolais is always a red wine, you're not really outing yourself as a wine-geek newbie, as only about 20 percent of the wines of the region are Chardonnay- or Aligote-based whites. Gamay-based reds are the bread and butter of this prolific wine region south of Burgundy, and they make up a hearty share of the everyday table wine gulped by gastronomes in the nearby food-and-drink-loving city of Lyon, which some call France's second culinary city after Paris. Beaujolais reds can range in color from a dark red-berry hue right down to a lighter shade of crimson; but pink Beaujolais is a wine of an entirely different color, so unusual that only a handful of producers make it. Which is all by way of introducing us to today's featured wine, the 2011 "Les Griottes" Beaujolais Rosé from Domaine de Vissoux, which I picked up for $14.99 recently at my local Whole Foods wine shop. On the winery website, wine makers Martine and Pierre-Marie Chermette declare that this rosé is "recommended for the hottest days of the year!" The Chermettes, billed as pioneers of sustainable viticulture in the Beaujolais, discuss their wine-growing and wine-making philosophy on this Web page, The art of making wine that reveals the grape. They've been making a rosé Beaujolais since 1985, and appear to be one of the first among this small but growing niche. Rosés and all the world's pink wines draw our attention in this month's Wine Focus topic in our online WineLovers Discussion Group. You're warmly welcome to become a part of our friendly international crowd of online wine lovers as we taste and talk about rosé wines. To participate in the conversation, simply click to the forum topic "Rosé!" FOOD MATCH: This crisp, refreshing rosé is versatile with food. The winery suggests serving it with appetizers, salads, grilled meats, barbecue, seafood, savory pastries, fish and fish terrine and, it says, "ideal with Exotic cuisines including West Indian and Asian." I took them up on that idea with a spicy Ethiopian kale stew, Gomen Wat, and was delighted with the pairing. WHEN TO DRINK: This fresh and youthful delight is going to be best while it's young. I'd plan to drink the 2011 this summer and look for the 2012 next year. VALUE: This local price, right on the $15 national median reported on Wine-Searcher.com, is more than fair for this delicious rosé. Les Griottes = "Lay Gree-oat"
The winery website is published in French, English, Russian and Chinese. 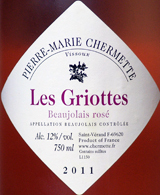 Here's a link to the English-language fact sheet on "Les Griottes" Beaujolais Rosé . I picked up this bottle from the "eco-friendly" shelf at the Whole Foods wine shop in Louisville, and would suggest checking this source first if you have a Whole Foods in your community. Also, locate U.S. and international vendors and check prices for "Les Griottes" Beaujolais Rosé on Wine-Searcher.com.